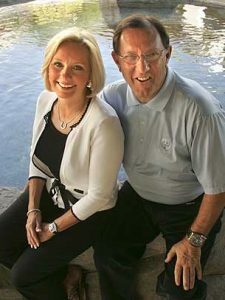 Daranne and Paul Folino epitomize the ideal for the Spirit of Philanthropy Lifetime Achievement Award. Paul shares his energy, leadership and business expertise with numerous nonprofit organizations. His passionate involvement has shaped and continues to influence the activities of the MIND Institute, Orange County Performing Arts Center, Orange County Business Committee for the Arts, South Coast Repertory, Chapman University, Project Tomorrow, and Cal State Fullerton’s College of Business and Economics. In each case, Paul serves as a Board member at the highest level, providing leadership gifts for campaigns and operating support, and helping to generate millions of dollars in support. Daranne and Paul give generously of their resources and talent and are deeply committed to the well-being of Orange County. They exemplify the altruistic values of philanthropy. 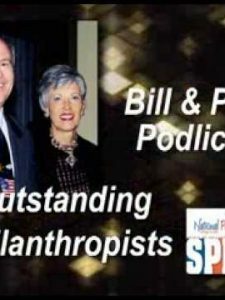 Pat and Bill Podlich are being celebrated for the generosity, wisdom and diligence they bring to their giving to our community. After co-founding PIMCO (Pacific Investment Management Companies) in 1971, Bill led the firm to become the nation’s pre-eminent manager of fixed-income securities during his 22-year tenure as the chief executive. He now serves as a Consulting Managing Director for the firm, and with his wife finds great joy in giving back to the community. For the past 10 years, they have focused their time, resources, and leadership in four primary areas: education, building local philanthropy, civic engagement, and the arts. 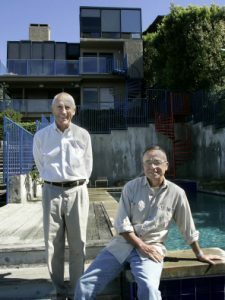 The Podlichs have been prominent in supporting the Southern California charter schools movement and have advocated the spirit and practice of democracy by endowing a fellowship for graduate students at UC Irvine, where he is an active member of the UCI Foundation Board. Additionally, Bill serves on the boards of the Business Committee for the Arts, Orange County’s Pacific Symphony Orchestra and the Orange County Community Foundation. The Podlichs are admired for their sincere altruism and giving spirit. 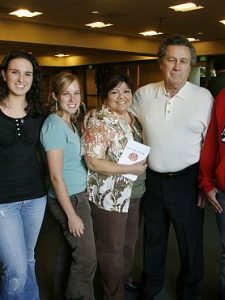 In 1985, Al Roberts saw people were in need and he pulled a group of friends together to raise money and to start an agency. The result was that he became the Founding President of the Board of the new AIDS Services Foundation of Orange County. That same year, Al held the first fundraiser for ASF in his backyard. “Splash” was soon known as the largest backyard fundraiser in North America and today is held on the grounds of the Laguna Beach Festival of Arts and raises approximately $500,000 each year. For 20 years, Al has continued to serve on the Board and has made ASF a strong organization, providing fiscal and service accountability annually to 1,600 men, women and children affected by HIV/AIDS in Orange County. Al’s leadership has cultivated interest and awareness about HIV/AIDS throughout California resulting in increased volunteerism, community participation, and prevention. 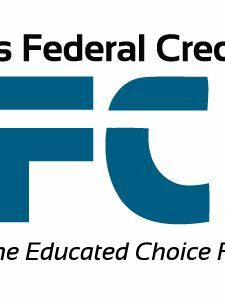 For more than seven decades, the Orange County Teachers Federal Credit Union has provided exemplary service to generations of Orange County families. The philosophy of “People Helping People” has remained constant through the years. OCTFCU provides financial, leadership, and volunteer support to a broad range of community and education organizations. From 2001—2005, OCTFCU donated $1.8M to groups such as the Discovery Science Center, Ocean Institute, Academic Decathlon and Pentathlon and to K-12 school districts throughout Orange County. In 2003, OCTFCU created a non-profit Education Foundation in partnership with the Orange County Department of Education, to support core educational programs by awarding grants to public and private schools, awarding 46 in the first two years. Institutions of higher learning have also greatly benefited with gifts. Many OCTFCU executives commit hundreds of hours of volunteer time each year as leaders on nonprofit Boards setting the example for strong participation of the OCTFCU workforce in philanthropic endeavors. OCTFCU is an Outstanding Business providing extraordinary support to improve the lives of a vast number of residents across the region. Twenty-five years ago, John Brown opened the doors of his event production company, The Showpros. 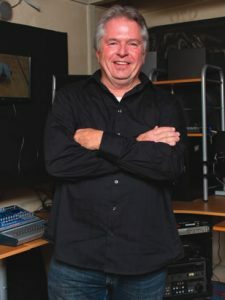 With only four employees, he developed a client list of major corporations and a reputation for successful events, providing video services, stage management, and event consultation. Wanting to make a difference in his community, John reached out to nonprofits and began producing events for a multitude of organizations at deeply discounted prices. He estimates that he has donated more than a $1M cumulatively benefiting such Orange County organizations as Goodwill, Boy Scouts, American Diabetes, AIDS Services Foundation, Laguna Beach Art Museum to name just a few — all with the purpose of helping the nonprofit “put its best foot forward”. 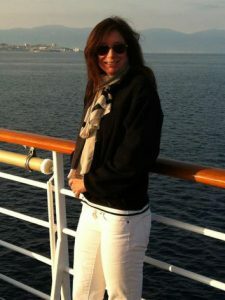 The Showpros share their creativity and time to help nonprofits be more successful making them an Outstanding Business. 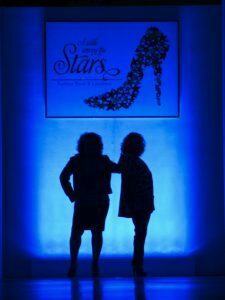 Walk Among the Stars (WATS) was established in 1990 as a volunteer group within the St. Jude Memorial Foundation. It is a partnership of cancer patient, St. Jude Medical Center cancer professionals and community members. WATS is dedicated to building support for the hospital’s Cancer Services through a signature fundraising event that features cancer survivors as models in a fashion show. By celebrating the courage and successes of survivors, WATS shares a hopeful message about cancer that inspires and encourages others. In 1989, after two teens died on prom night, Dr. Thomas Shaver, the trauma director at Mission Hospital, created a “safe rides” program for Orange County. Seventeen years, later, over 200 teenagers from eleven high schools are passionate about this program and committed to its success. South County Safe Rides’ 200 teens serve over 29,000 high school students by being available on Friday and Saturday nights from 10:00 p.m. to 1:00 a.m. Since 1993, this youth program has transported more than 3,000 middle and high school students, potentially saving lives with each transport. Through this program, Mission Hospital has formed a high performance, compassionate team who has learned the value of life and developed a sense of responsibility for themselves, their peers and communities.